(2015) "Over and Over Again"
"Boys Like You" is a song recorded by American singer Who Is Fancy, featuring American singer-songwriter Meghan Trainor and American singer Ariana Grande. It was released as a single on November 23, 2015. Jake Hagood, better known as Who Is Fancy, is an American singer. He co-signed with Scooter Braun and Scott Borchetta on Big Machine Label Group and Dr. Luke on Prescription Songs. His single "Goodbye" was released in early 2015, peaking at number 29 on the Billboard Mainstream Top 40 chart. Fancy was presented at the iHeartMedia Music Summit, although his identity was kept secret. Meghan Elizabeth Trainor is an American singer-songwriter. Interested in music from a young age, Trainor wrote, recorded, and produced three independently released albums between 2009 and 2011.
Who Is Fancy performed the song by himself during the time when he was the Opening Act for Ariana Grande's The Honeymoon Tour. Season twenty-one of the American television competition series Dancing with the Stars premiered on September 14, 2015. "Better When I'm Dancin'" is a song recorded by American singer-songwriter Meghan Trainor for the soundtrack to the film The Peanuts Movie (2015). Epic Records released it on October 13, 2015, as the first and only promotional single from the soundtrack. Trainor co-wrote and co-produced the song with Thaddeus Dixon. "Better When I'm Dancin'" is a tropical track that strays from Trainor's usual musical style, being described as "breezy and harmless" with traces of house music. The music video features computer cartoon animation. It starts with Who is Fancy swimming in a pool. The main point features him wearing a suit singing in front of a prison line while "Crossing the Line". Trainor is seen wearing a pink swim suit. After she is seen lying on a deck chair in cartoon form, she falls into the pool and is pulled out by the pool cleaner. She is also seen singing with Fancy in the prison in a purple dress. Next, we see Ariana Grande (With very big eyes) in a white skirt in cartoon form baking a cherry pie for the pool cleaner. As she attempts to give it to him, he knocks her into the pool and she is rescued by him with his pool net like Trainor was. Next, we see her wearing a purple skirt with Fancy and Trainor in the jail cell. The video ends with Fancy being locked in the pool service truck by Trainor and Grande after Fancy blowing a kiss. The song reached its highest international peak in New Zealand, where it debuted at number 34 on the New Zealand Singles Chart on the issue dated February 11th, 2016 and reached its peak of 26 two weeks later. The song was certified gold in its seventh week on the chart for achieving 7,500 in equivalent single sales units. The song became Fancy's first, Grande's eighth, and Trainor's sixth charting single in the country. 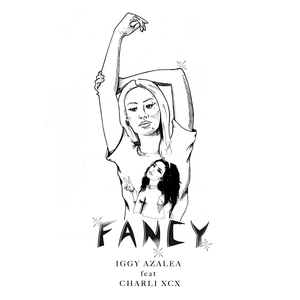 "Fancy" is a song by Australian rapper Iggy Azalea featuring British singer Charli XCX, taken from the former's debut studio album, The New Classic (2014). It was released on 17 February 2014 by Def Jam Recordings as the fourth single from the album. "Fancy" was described as an electro-hop song. It was written by Azalea and XCX, composed and produced by production team the Invisible Men, alongside additional producers The Arcade. It was leaked under the title "Leave It" in December 2013. "Like I'm Gonna Lose You" is a song recorded by American singer-songwriter Meghan Trainor featuring American singer John Legend. 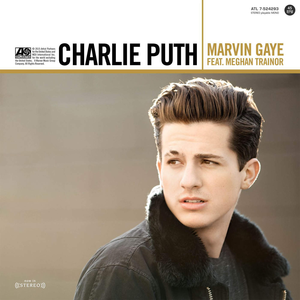 Epic Records serviced it to contemporary hit radio on June 23, 2015, as the fourth and final single from Trainor's debut major-label studio album Title (2015). Trainor co-wrote it with Justin Weaver and Caitlyn Smith, and co-produced it with Chris Gelbuda. "Like I'm Gonna Lose You" is a soul love song which conveys the message to not take time with loved ones for granted. Trainor wrote it after she dreamt about a loved one dying. "Me Too" is a song recorded by American singer-songwriter Meghan Trainor for her second major-label studio album Thank You (2016). It was written by Trainor, Eric Frederic, Jacob Kasher Hindlin, Jason Desrouleaux, Peter Svensson, and produced by Ricky Reed. The track was released on May 5, 2016 as the second single from the album. The electro and R&B song has lyrics about self-love and self-empowerment, urging listeners to be more content and confident with themselves. It received mixed to negative reviews, with some critics accusing Trainor of bragging. "Breathin" is a song by American singer Ariana Grande from her fourth studio album Sweetener (2018). It was written by Grande, Savan Kotecha, Peter Svensson, and its producer Ilya Salmanzadeh. The song was sent to US contemporary hit radio on September 18, 2018, serving as the album's third and final single. Lyrically, the song speaks about how breathing is affected when suffering from anxiety and is based on Grande's own experience. "Needy" is a song by American singer Ariana Grande from her fifth studio album, Thank U, Next (2019) through Republic Records. It was written by Grande, Victoria Monét, Tayla Parx, and its producer Tommy Brown. It was released as the album’s fourth single on March 14th, 2019. ↑ Mike Wass (November 11, 2015). 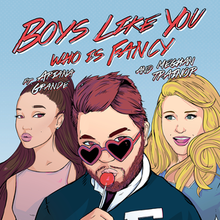 "Who Is Fancy's New Single "Boys Like You" Features Ariana Grande AND Meghan Trainor". Idolator . Retrieved November 13, 2015. ↑ "Ariana Grande Teams With Who is Fancy For 'Boys Like You' Song". M-Magazine. M-Magazine. November 23, 2015. Retrieved November 23, 2015. ↑ "Who is Fancy, Ariana Grande, & Meghan Trainor's "Boys Like You" Impacts Pop Radio on 12/1 (Updated)". Headline Planet. Headline Planet. December 2, 2015. Retrieved December 2, 2015. 1 2 "Ariana Grande and Meghan Trainor are on Who Is Fancy's new single 'Boys Like You'". digitalspy. November 23, 2015. Retrieved November 26, 2015. ↑ "Dancing with the Stars Finale: Who Will Take Home the Mirrorball Trophy?". ABC . ABC. November 23, 2015. Retrieved November 23, 2015. ↑ "ČNS IFPI" (in Czech). Hitparáda – Digital Top 100 Oficiální. IFPI Czech Republic. Note: insert 201550 into search. ↑ "Dutchcharts.nl – Who Is Fancy feat. 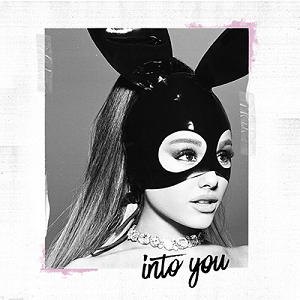 Meghan Trainor & Ariana Grande – Boys Like You" (in Dutch). Single Top 100. Retrieved December 5, 2015. ↑ "NZ Top 40 Singles Chart". Recorded Music NZ. January 18, 2016. Retrieved January 11, 2016. ↑ "Listy bestsellerów, wyróżnienia :: Związek Producentów Audio-Video". Polish Airplay Top 100. Retrieved February 15, 2016. ↑ "ČNS IFPI" (in Slovak). Hitparáda – Singles Digital Top 100 Oficiálna. IFPI Czech Republic. Note: insert 201550 into search. 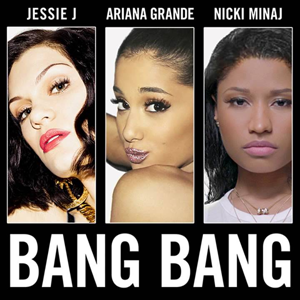 ↑ "Who Is Fancy Chart History (Bubbling Under Hot 100)". Billboard. Retrieved 9 December 2015. ↑ "New Zealand single certifications". Recorded Music NZ . Retrieved February 12, 2016.